It has been a long time since I’ve enjoyed a Bordeaux tasting as thoroughly as I did this season’s final Wine Media Guild lunch. For more than a few years now, I’ve been unhappy with a lot of the biggest names in Bordeaux because the wines have been tasting – how to put this? – more and more industrial to me, as if they were the end-result of a large-scale commercial production. 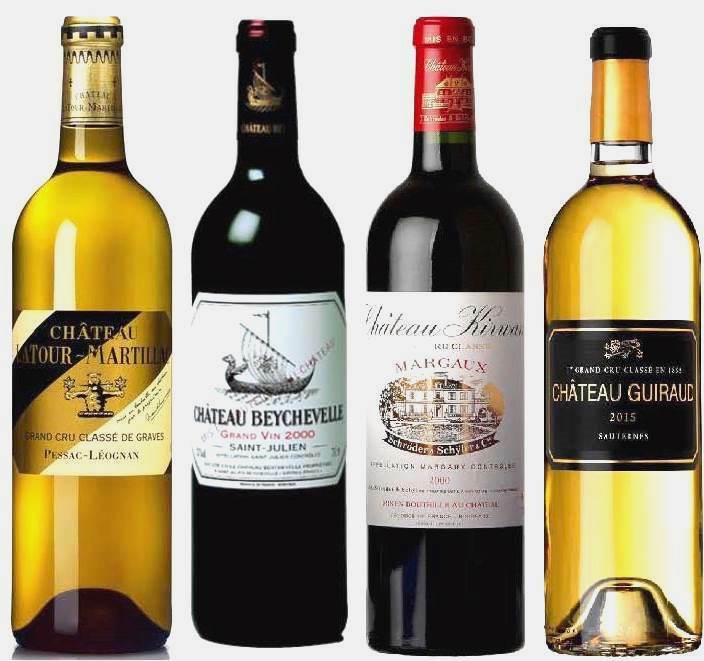 Whatever the truth of that, there were no such problems with the WMG’s tasting of Château Latour Martillac (Pessac Leognan), Château Beychevelle (Saint Julien), Château Kirwan (Margaux), and Château Guiraud (Sauternes). All were classic examples of what their appellations ought to be – or what my memory tells me their appellations used to be before The Sacred Quest for Parker Scores homogenized Bordeaux. If these wines are bellwethers of a wave of post-Parkerism . . . well, let’s just say it’s about time. What I was impressed by in these four estates was their balance, elegance, restraint, fidelity to variety and terroir, and vitality – all qualities likely to escape the notice of the wine newbie or wannabe interested only in bold fruit, but ultimately the characteristics that separate fine wine from fermented grape juice. The Latour Martillac reds all showed the lovely cedary-ness and sinewy-ness, the whites the roundness and vigor of the Graves. The Beychevelles had all the balance and appeal, the cushioned Cabernet flavors, that one hopes for in Saint Julien. The Kirwan wines were simply classic Margaux, enticing in the nose and opulent in the mouth. And the Guiraud wines presented a symphony of botrytis and mineral flavors, amazing sweetnesses counterbalanced by vivid acidity, that amount to almost a definition of Sauternes. These were Bordeaux wines as I haven’t experienced them in a long, long time, and I loved every minute of it. Any of these wines, even the oldest, could mature further. The ’98 Guiraud, for instance, still needs ten years to reach its peak, and none of 2000 reds showed any sign of fading. The 2000 Kirwan, in fact, was one of the top two wines of the day for me. The younger wines all seemed to be developing quite nicely, with the 2005 Beychevelle in particular (my other top-two wine) already tasting splendid and promising years of further development. Were I several decades younger than I am, I would be cellaring these wines and trying to keep my hands off them for at least a few years more. That last wine is a rather charming demi-sec. The two second-labels presented, Amiral de Beychevelle and Charmes de Kirwan, both showed as smaller but still elegant versions of the primary wines. One last noteworthy quality of all the wines shown was the consistency of style each house demonstrated over several quite different vintages, which is no small accomplishment. It would be a wonderful thing if a great Bordeaux revival was a-borning. This entry was posted on May 21, 2018 at 7:00 am and is filed under Bordeaux, France. You can follow any responses to this entry through the RSS 2.0 feed. You can leave a response, or trackback from your own site. Nice piece. I thought I’d share my experience with two interesting 2005 Haut-Medoc’s from producers of spotted history: Larose-Trintaudon and Cantemerle. While these producers have never been known to make bad wine, they have, in the past, settled for putting out strings of indifferent vintages. Now, for sure, the 2005 would be a place where even the mediocre can get lucky, but what happened to these properties in this vintage could not be the result of a roll of the dice. Both wines shine in their own manner. The Cantemerle gives structure and firmness of fruit with the complexity that an abundance of healthy fruit can sometime yield (it achieves what one should expect from a ‘classified’ growth). It’s probably nearing its peak of maximum pleasure, though the stuffing suggests a few years of improvement might be in the offing. The Larose-Trintaudon is the more supple of the two, yet not bereft of structure and a real generosity of multi-valent fruit. These wines are in the market and far from rare, so I advise seeking either (or both) out. The latter wine will not break the bank at $20, and the former, at $45, is not unreasonably priced for drinkable Bordeaux of such high quality. Thanks for the very useful comments, Joe: It’s good to hear from you. As it happens, I just recently tasted a 2010 Larose-Trintaudon, and it struck me too that this widely distributed, inexpensive wine had seriously upped its game — a very encouraging development for all us winos with a long-standing crush (pun intended) on classic Bordeaux. I’m not even a little embarrassed to note that I’ve recently tucked away 20 bottles of the 2010 Larose-Trintaudon for the near-long term drinking window. Approachable now, the wine will reward a little patience. A Votre Sante!